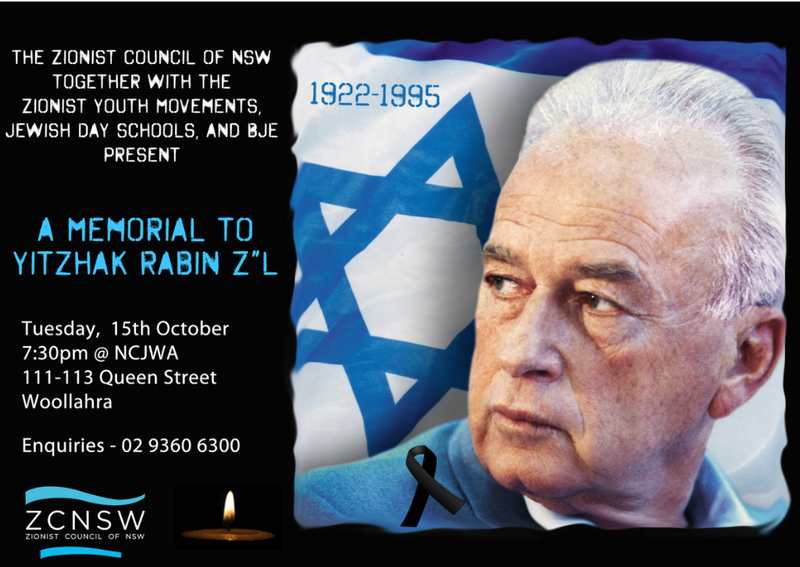 Join the Zionist Council of NSW, together with the Zionist Youth Movements, Jewish Day Schools and BJE for a Memorial to PM Yitzhak Rabin Z’L – 18 years. Tuesday, 15th October at NCJWA – 111-113 Queen Street, Woollahra at 7:30pm. Representatives from the Zionist Youth Movements will join Jewish Day Schools and BJE to tell Rabin’s story make presentations about peace, sing songs and remember one of the most important political figures in recent history. Honorary Life President of the ZCNSW – Dr. Ron Weiser AM said that Rabin “exemplified middle Israel”. “He was a very committed Zionist and he believed very strongly in the security of the state” he said. “He was in fact an ideal person to head out the perilous mission of trying to make peace – and I think people trusted him to do that – because he had a great knowledge and belief in the security needs of the state of Israel”. “The ceremony is not just about remembering the man, but also learning from circumstances of the division that existed in Israel prior his assassination in 1995” added Ron.